Faction Brewery's 4,000 square-foot deck is kid and dog friendly. Situated along an abandoned airstrip across the bay from San Francisco, a handful of craft distillers, brewers and wine makers have set their sights on reviving small-batch libations while offering tastings and tours out of WWII-era hangars on the site of Naval Air Station, Alameda which was closed in the 1990s. On a stretch of Monarch Street, dubbed "Spirits Alley," St. George Spirits, Hangar 1 Vodka, Faction Brewery, Building 43 Winery and Rock Wall Wine Company have created a convivial block where wine, beer and spirits enthusiasts can meet up to raise a glass and take in the sweeping view of the San Francisco skyline. Coincidently, it was a sweeping ocean view in San Diego that had led us to this very spot. 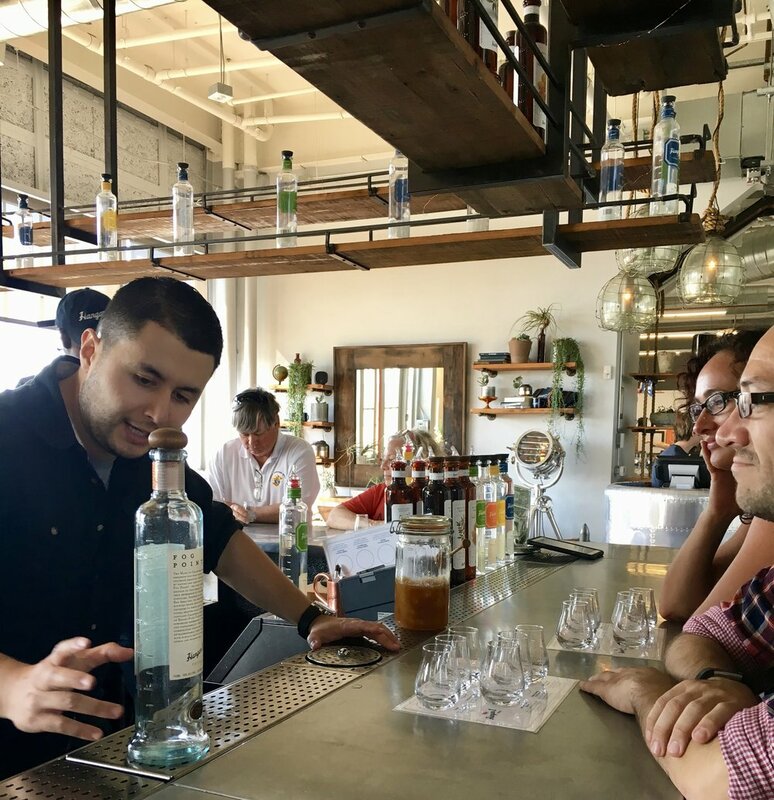 After tasting a cocktail made with Hangar 1 Vodka at a restaurant overlooking La Jolla Shores we were intrigued to find out more about the brand and learned about the tasting and tour facility in Alameda. We were already planning to be in the Bay Area for a family gathering and so we booked a tour to visit Hangar 1 for a tasting. We took a scenic 20-minute ferry ride from the Ferry Building in downtown San Francisco to Alameda and then made the 15- to 20-minute walk from the ferry landing to Monarch Street. It was then we realized there was a whole craft collaboration happening along Spirits Alley. In 1982, St. George Spirits was the first small American distillery to open after Prohibition and it was first to occupy space on Monarch Street when it moved its operations in 2002 to the 65,000-square-foot hangar that is now its current location. Its artisanal spirits include gins, vodkas, absinthe, whiskeys, rum, brandies and liqueurs. Unfortunately, its tasting room was closed on the day we were there so we didn't get to have a look inside. We did have time to kill before our tour at Hangar 1 so we redirected our attention across the parking lot to the lively crowd drinking beer at Faction Brewing and made our way over to see what was on tap - we found 27 beers ranging from pale ales and IPAs to porters and stouts. The taproom of Faction Brewery. Open since 2013, Faction Brewing began with just a 6-tap kegerator and a few seats but now boasts a 20-tap direct draw system, a 30-ft. redwood bar and plenty of seating inside and out. A variety of food trucks make appearances to supplement the modest menu of ready-made snacks available for order at the bar. Faction offers pints, tulips and tasters on site as well as 32 oz. and 64 oz. growlers and bottles to go. We found two seats at the end of a community table on Faction's 4,000 square-foot deck to enjoy our beer and made fast friends with others at the table. The brewery is owned by a husband-and-wife team and the place has a family-friendly vibe. Just beyond the deck, kids played games while adults imbibed and there were even a few baby strollers parked tableside. The majority of the crowd looked to be locals meeting up with friends, celebrating family birthdays or taking a day take trip out of the city to catch some sunshine in the East Bay. The Faction Pilsner and Brixton Pale Ale we tried were very good but when we went inside to get another the line for the bar had grown long and now looked like a queue for an airline flight. So, we went across the street to take a look inside Building 43 Winery with its large metal door welcomingly open. The space was a former locker for military explosives but today it's a tasting room for handcrafted, small-batch wines primarily from the Sierra Foothills. We each ordered a glass of wine and took a seat at one of the high-top bar tables in the lounge area. In keeping with the history of the building, the winery interior is rustic yet refined with art and objects reminiscent of its military roots. You can order wine by the bottle, glass or tasting flight and enjoy it at the bar or in the various lounging areas - inside and outside. The winery was more suited toward couples with its intimate setting but there was also a party going on in a private room. We finished our wine and headed back across the street to Hangar 1 for our tasting tour. We entered the hangar and checked in for the tour in the tasting room. The previous tour was just wrapping up so we browsed the bottle shop just off the bar. The bottle shop is a necessary adjunct for Hangar 1 to sell its vodka on premise. Due to post-Prohibition laws still in effect, sales of the liquor can only take place through a third-party distributor which they were smart to share hangar space with. We met up with Jacob, our witty and engaging guide and entered the lab to begin the tour. Jacob told us about the master distiller at Hangar 1 Vodka - a women named Caley Shoemaker who began her career in crafting spirits with a whiskey brand in Colorado before bringing her deft hand to Hangar 1 Vodka. She is a professed "spirits nerd" who loves to experiment with the fresh ingredients she sources from local farmers in the Bay Area. Jacob was a bit of a chemistry enthusiast which came through during his explanation of how the distilling process works while the alcohol rises through 18 chambers of two very large, gleaming, copper distilling columns. We moved on to my favorite part of the tour which was the "see, smell and taste" curio chest. The botanicals on the cabinet included fruit in jars, stems with fresh leaves, dried chipoltes, pink pepperberries, grains and even a jar of honey - all ingredients used in making Hangar 1 vodkas. . Jacob explained the process of Shoemaker's selection of fruit as he passed around a jar containing Budda's Hand used in making the Hangar 1 Citron vodka. The distiller chose Budda's Hand because it is not as acidic as regular lemons. The Makrut Lime vodka is infused with the leaves of the plant rather than the actual fruit because the leaves offer the most flavor and aroma. The story behind the flavor profile of every vodka was very interesting, especially the Distiller's Exclusives which are only available through the bottle shop at the distillery. Those included Pink Peppercorn, Chipolte and Honeycomb. Hangar 1 even has a vodka made from fog. Its Fog Point Vodka has a very limited run and won't be available again until the fall. It retails for a hefty $129 per bottle but 100% of the profits go back to water conservation efforts. If you don't want to buy the whole bottle you can order a Fog Point Martini for $43 at Epic Steak restaurant in San Francisco made with Hangar 1 Fog Point Vodka. There is still a lot of available space for expansion and only the vodka bottled in Hangar 1's signature graduated cylinder-style bottles are filled at the hangar. The bottling area was modest in size and was not in operation during our tour. With the knowledge we had gained we headed to the tasting room for the real reason we were all there - to drink some vodka. We tasted six different vodkas including the Straight, Citron, Mandarin Blossom, Pink Peppercorn, Chipolte and Honeycomb. As Jacob poured our tastings he also offered ideas for drink recipes we could make with each of the infused vodkas. The tasting room is set up for walk-ins to have tastings at the four-sided, stylish industrial bar too but there are no cocktails available. And don't expect more than six small pours because there are strict laws governing how much alcohol can be served in distillery tasting rooms. However, Bonnie who manages the bottle shop said there are plans in the very near future to have a portable bar outside that would serve cocktails under the separate third-party license. 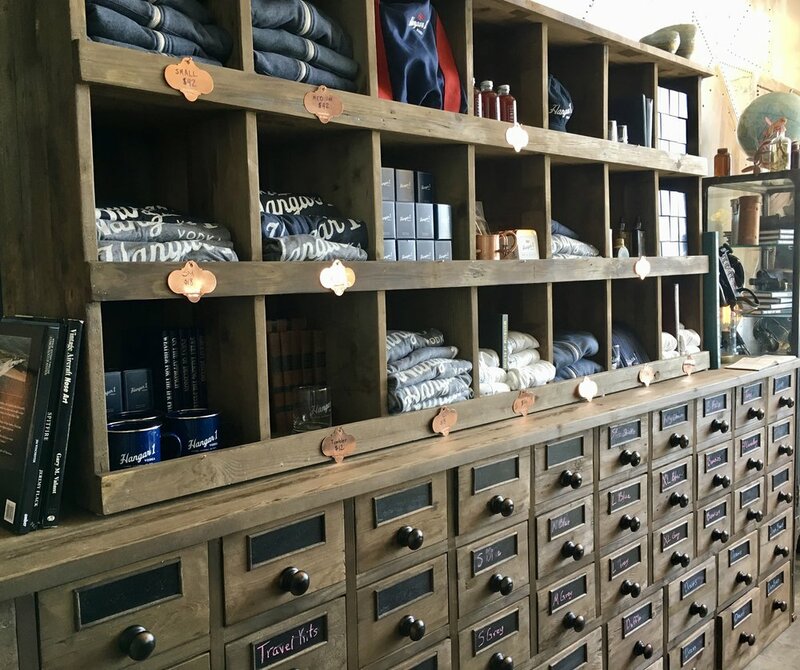 At the conclusion of the tour we took a look around the tasting room which was fitted out with a vintage flight yoke, bomber jacket and a retail area with t-shirts, hats and accessories and also left our information so we'd know when the next batch of Fog Point Vodka was available. We ran out of time to visit Rock Wall Wine Company so we'll have to do that on our next visit. And although Spirits Alley might seem like a great place for a nightcap the area does have a 7p.m. curfew due to a little, politically-connected neighbor named the California Least Tern. In the 1970's the birds decided the former airstrip on Alameda Island was an ideal location to hang out and it has become a very successful breeding site for the species. So much so, the government set aside 624 acres for the birds in 2014. This means the surrounding buildings cannot undergo any refurbishing that would disrupt the birds. So the structures and facades along Monarch Street will maintain their "authenticity" and you won't find electricity bringing light or music to this stretch of road.